Taxi Brouwer uses the Schiphol Sta Strook, which means that we are allowed to park in front of the Schiphol Airport Arrival exit. 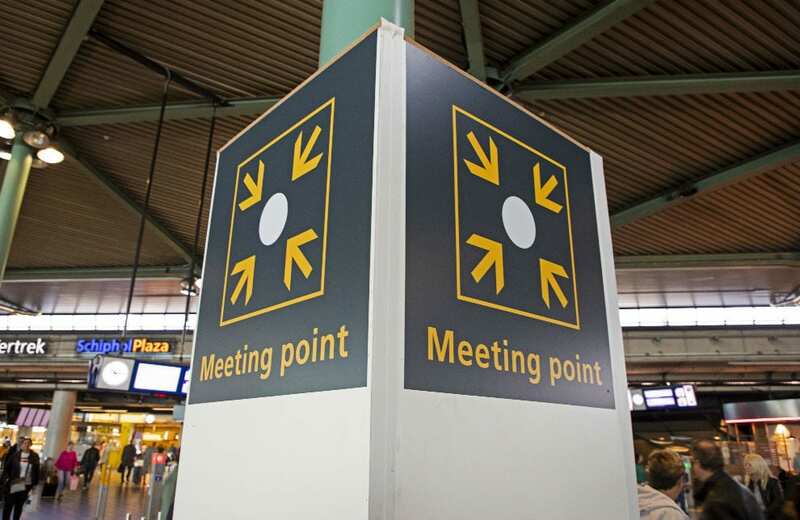 The Taxi Brouwer driver will meet its passenger at the Schiphol Airport Meetingpoint, in the middle of the arrival area. 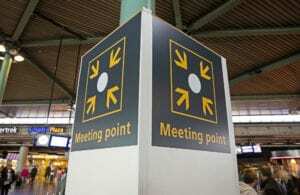 The Taxi Brouwer driver will hold a sign with the passengers details at the Schiphol Airport meetingpoint. Please send our dispatcher your flight details, we will make sure your taxi will be on time at Schiphol Airport in respect to any delays or changes! For some large companies and hotels Taxi Brouwer provides a daily Schiphol Airport Taxi bus shuttle service. Special Schiphol Airport VIP arrangements are also possible, our driver will then wait near the exit gate holding up a sign with the passengers details. The Taxi Brouwer driver will always carry your luggage or trolley from the Schiphol Meeting Point or from the gate exit to the taxi and your destination. At Schiphol Airport our drivers are easy to recognise by wearing an impeccable dark business suit, with blue-yellow striped tie and golden name badge.